Finally, Microsoft has released Office 2016 Preview for Windows desktop users, after releasing Office 2016 for Mac Preview in earlier March 2015 for Mac OS X desktop users. The Office 2016 Preview contains full-fledged Microsoft Office 2016 desktop products, unlike the universal Office apps on Windows Store which are optimized for touch-enabled devices. There are two programs been launched by Microsoft for the Office 2016, namely Office 2016 Preview (for Home) and Office 2016 Preview (for Business). Both is currently from February Technical Preview Refresh, and includes complete suite of Office products as in Microsoft Office 365 ProPlus, including Word 2016, Excel 2016, PowerPoint 2016, Outlook 2016, Publisher 2016, OneNote 2016, Access 2016, Lync 2016 (Skype for Business) and OneDrive for Business, plus Visio 2016, Project 2016 and Project Server 2016. The main differences between Office 2016 Preview (for Home) and Office 2016 Preview (for Business) is that Business edition contains only Office 365 ProPlus, is geared towards IT administrators of companies and corporations, and comes with various XML files for IT administrator to customize deployment in their environment. Meanwhile, Home edition allows users to instantly install Office 2016 Preview right away, with options to install Office 2016 for ProPlus, Home (or Home Premium which lacks Lync client) or Business Premium (or Small Business Premium which lacks Access and Lync client). 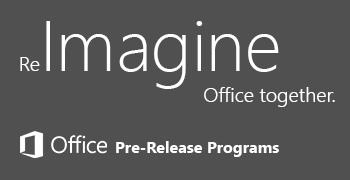 The installation of retail version of Office 2016 Preview is done through C2R (Click-to-Run), and currently the version Office 2016 Preview installed is build 16.0.3823.1005. A little nuisance is that the Office 2016 Technical Preview requires a active working Office 365 subscription for activation. The supported Office 365 subscription includes Office 365 Personal, Office 365 Home (Home Premium), Office 365 Business, Office 365 Business Premium (Small Business Premium), Office 365 ProPlus, Office 365 Enterprise E3 and Office 365 Enterprise E4 (ProPlus). In addition, if you’re installing Visio 2016 and/or Project 2016, the active subscription for Visio and/or Project is also required. You will need to answer a brief survey before participating and start downloading a script to install Office 2016 Preview via Click-to-Run. For Home users, the survey asks for email address which received the invite to participate in the program, but it appears that everyone is accepted to the program. Currently, Office 2016 Preview does not support side-by-side install with older Office software, such as Office 2013, Visio 2013 and Project 2013. Update: Office 2016 Preview is now publicly available, including ability to install it without Office 365 subscription. Tell Me – type what you’re looking for in the Tell Me box at the top right corner of the Ribbon and results are shown as soon as you start typing, and with “word-wheeling”, every keystroke refines the results so that you can click on what you’re looking for as soon as you see it. Higher DPI support for 250% and 300%. Pan and zoom while loading large charts and SmartArt. Updated backstage user interface – the Browse button is much more visible and in the Open and Save As tabs, the order of storage locations tabs has been updated to reduce confusion. Insert images with the correct orientation with automatic image rotation. Accessibility improvements through dark theme for users with visual impairments who find overly bright displays unusable in Office 2013 and enabling of previously blocked keyboarding scenarios in Excel for features like Pivot Tables and Slicers. Lean storage footprint with Shorter time frame of emails to download in Outlook – down to 1 day, 3 days, 7 days, 14 days, or 30 days. Support for small screen portrait layouts in Outlook. MAPI-HTTP protocol replacement for RPC-based sync that supports Exchange/Outlook connectivity. Foreground network calls are dropped to ensure that Outlook stays responsive on unreliable networks. Email delivery performance improvement by reducing the amount of time it takes to download messages, display the message list, and show new email after resuming from hibernation. Reliability, performance, and usability improvement of Outlook search, and integrated the FAST-based search engine in Exchange. Multiple timeline bars in a single view with customized date range in Project. Visio getting started feature makes the Visio canvas more inviting by providing a select set of pre-crafted starter diagrams which will help the users in some of the very core scenarios for that template. New avatar and features of Lync, recently rebranded Skype for Business, complete with the new logo and branding in the user interface. Keyboard access for Shape Panel in Visio where F6 cycles into the shape panel, TAB cycles through the different sections of the shape panel. Arrow keys allow users to navigate between the individual elements. Ctrl + TAB will allow users to quickly switch between STENCILS and SEARCH views. Building Plan and Electrical stencils have been refreshed with new shapes in Visio. Easily attach Office documents from the Ribbon or Action Bar that you most recently used to your Outlook emails by picking your document from the dropdown options. For files already in OneDrive, OneDrive for Business or SharePoint, you have the option to share them as an “Edit” or “View only” link instead of as a traditional attachment for collaboration. Read only mode for Excel. Search in field list, used for adding fields to Pivot Tables and Pivot Charts, and data model improvements. Excel time series forecasting sheet functions for predicting future values based on historical data. Support for multi-selection of Slicer items using touch in Excel. Time grouping for model based Pivot Tables allows grouping to be used in conjunction with the power of the xVelocity engine and are a key feature for making Data Model PivotTables a replacement for native ones in the future. PowerView over an OLAP connection support in Excel. Data model PivotTable automatic relationship detection in Excel. Business Intelligence (BI) features are much easier to find in your Excel experience. If you’re using one of the BI feature (Power View, Power Pivot or Power Map) the rest will be turned on automatically for you. You can also turn on all the BI Features by going to Excel under File > Options > Advanced > Turn on data analysis features, instead of File > Options > Add-Ins > Manage “Com Add-ins” > Go. Rename tables, columns and measures in Power Pivot and adjustments of PivotTables support in Excel. Excel data cards display rich tabular data for a specific geolocation on mouse hover or selected visual. Better network traffic management. New Background Intelligence Transfer Service (BITS) to help prevent congestion on the network. BITS throttles back the use of bandwidth when other critical network traffic is present. Enhanced distribution management. Improved integration with System Center Configuration Manager (SCCM) to allow IT admins to efficiently download and distribute monthly Office updates using the native SCCM features. Flexible update management. New way for admins to manage the pace at which they receive feature updates and bug fixes while continuing to receive regular security updates. Simplified activation management. New feature in the Office 365 Admin Portal to allow admins to manage device activations across users. To enable Data Loss Protection (DLP), the classification and policy definitions between Word, Excel, PowerPoint clients and the Information Protection service end point are synchronized. 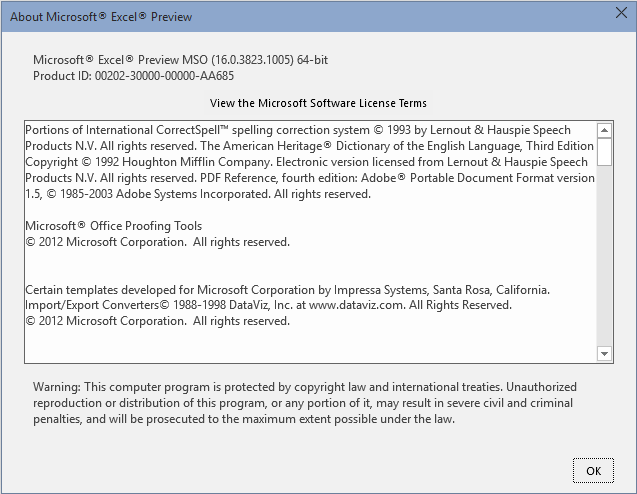 By introducing DLP experiences within Word, Excel and PowerPoint, IT administrators can centrally create, manage and enforce polices and restrictions for content authoring and document sharing, ranging from something simple like instituting a “notification” of a violation, to allowing users to “override” with a justification, to finally “block” dissemination of content. And end users will see policy tips or sharing restrictions when the apps detect a potential policy violation. Information Rights Management (IRM) protection for Visio files, which provide persistent online and offline protection of e-mail messages and attachments, documents and diagrams. Multi-factor-authentication (MFA) through integration of ADAL (Active Directory Authentication Library) streamlines sign on for the whole Office suite and layers security through the process in one single sign on. Office 2016 is expected to available to consumer in the second half of 2015.